Given the age we find ourselves in, all MICE events need to be marketed online as this is where our audience lives. As a conference organiser, it is imperative you create an in-depth digital marketing plan in order to do this successfully. If you have never attempted this before, it can prove quite the challenge and I strongly recommend seeking the expertise of a professional. 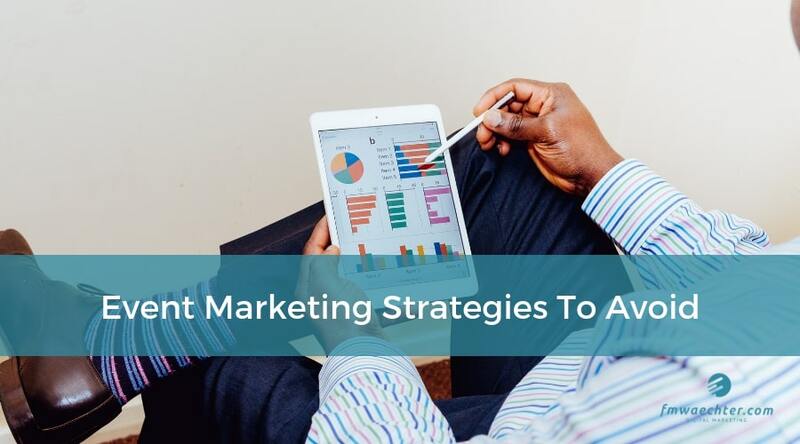 Further to the technicalities involved in digital marketing, there are quite a few event marketing strategies to avoid. Failing to do so will result in a half-filled venue, or worse; a negative post-conference response from attendees. Here are 7 event marketing strategies you need to avoid. Although difficult to measure, I assure you that shamelessly promoting your event 5 times a day online will push people away rather than attract them to your conference. This is not one of the effective event marketing strategies. Instead, your audience may start seeing you as annoying and that is the very last thing you want. Start promoting your event about three months before starting with a single social post and email, three times a week. When building up to the meeting, you can then post more frequently, but do so in a creative and exciting way. Mix it up, think outside of the box. Talk about the benefits, keynotes and entertainment rather than constantly reminding people to purchase a place. From the word go, you need to be concise about what it is your event, be it a conference, meeting or exhibition is going to offer to attendees. Do this by clarifying the event. Is it a networking event? A tradeshow? Further to this, elaborate on the value this event will provide the attendee. Every time you communicate with your audience, whether across social media or via email, it should only contain a single message. You do not want to confuse your audience by touching on multiple aspects of your event in one post or email. Stick to one message followed by a call-to-action. If you start promotion well ahead of time, you will be able to cover all the information you need to communicate. Do not over promise. If there is any doubt that you may not be able to deliver on something, then refrain from including it in your itinerary. Further to this, perhaps include a disclaimer that notes that some activities may be subject to change. You do not want people purchasing a place at your conference for a specific speaker or workshop which ends up getting cancelled. Tip: For major activities, have a plan b just in case. You should establish and understand all the above before you start advertising your event online. Certain groups of people respond differently to different forms of online marketing. Depending on what age and gender make up your target audience, you will need to utilise certain platforms accordingly. For event promotion, I recommend LinkedIn and Twitter. LinkedIn for professional interaction and Twitter to join in on relevant industry conversations. Sometimes subtly promoting your event within a conversation online is just as effective as setting up ads. If you can get people talking about it organically, there is no cost involved. How can you expect to maximise your reach if you solely rely on your internal team for sharing the event and its relevant information online to their followers? Selling tickets, or filling places is a numbers game. So, in order to reach the maximum amount of people, I recommend asking your most loyal followers and your speakers or VIP guests to mention it to their followers, sharing it across multiple platforms to their own audience. A mistake that many rookie marketers make is that they disregard post-event marketing. This includes surveys, promotional offers, and posting event highlight content. How can you expect your followers to remember your brand within a sea of competition if you do not remind them of what they experienced? Send out thank you emails, publish post-event photo albums, ask questions and keep the conversation going well after the event. To avoid pitfalls when creating event marketing strategies, avoid these common mistakes. For information on digital marketing for the MICE industry, get in touch with me today.